Windchill ProductPoint 1.1 enhances Product Development Collaboration with a host of new capabilities. Leveraging Microsoft’s collaboration technology, Windchill ProductPoint enables product stakeholders—located anywhere—to share CAD and other structured data among teams. Efficiently populate Windchill ProductPoint by importing your Pro/ENGINEER and other unstructured files (such as MS Office documents) using bulk analysis and import tools. Integration with both Pro/ENGINEER Wildfire 4.0 and Pro/ENGINEER Wildfire 5.0 improves product development and team collaboration by giving Windchill ProductPoint users better visibility into design changes. With tight integration between Windchill ProductPoint and Mathcad, you can save and open Mathcad worksheets from within Windchill ProductPoint, while allowing users within Mathcad to directly navigate to Windchill ProductPoint server locations. Mathcad worksheets can now be saved to a pre-defined Calculations Structure Library either in the catalog site, or in any other structure libraries. Mathcad calculations can now be associated with a Pro/ENGINEER model file that has the analysis feature. Real-time design change notifications (‘toaster pop-up’) - Users of Pro/ENGINEER Wildfire 5.0 and Windchill ProductPoint 1.1 can see dynamic toaster pop-up notifications within Pro/ENGINEER Wildfire 5.0 whenever anyone updates, releases, locks or unlocks an object. Since very large models can often generate hundreds of iterations, Windchill ProductPoint now allows you to delete all minor versions of an item except for the latest iteration. In addition, Administrators can now proactively control the growth of database storage by defining automatic policies that limit the number of major versions for which minor versions are retained. Windchill ProductPoint now supports farm configurations with multiple web front-end servers, as well as a load balancer to improve scalability. New product items created in Pro/ENGINEER or in Windchill ProductPoint can now be automatically defined and updated using custom numbering and version schemes. Windchill ProductPoint now offers the option to specify whether users view either the most recent structure view, or the version that was last released. From within Pro/ENGINEER Wildfire 5.0, users can view the presence status and then contact any user associated with content managed on the Windchill ProductPoint server. 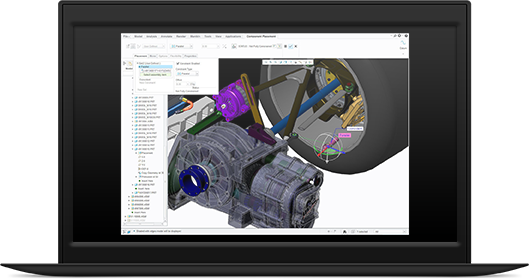 Quickly capture design and manufacturing notes associated with a product item. Users of both Windchill ProductPoint 1.1 and Pro/ENGINEER Wildfire 5.0 can view or edit a notes wiki that is automatically associated with a part or assembly. Users can define and automatically associate a collaboration space with any product item. Windchill ProductPoint 1.1 contains many new capabilities to improve user proficiency including: selecting and applying an action to multiple items at the same time; uploading multiple files to a structure library with one command; deleting items within a structure; and creating/deleting sites.